We’ve touched on smartphone laser tag before, otherwise known as augmented reality laser tag, and we have always had our doubts. But that’s only because we like the old school way of playing laser tag. You know, just tagging each other with laser tag guns and scoring points along the way, just the basics. Do smartphones really need to get involved? With mobile technology evolving so fast, augmented reality laser tag is the logical next step in the evolution of this beautiful game. Or is it? There have actually been quite a few attempts up til now to introduce the concept of AR into the world of home laser tag, and with mixed results. 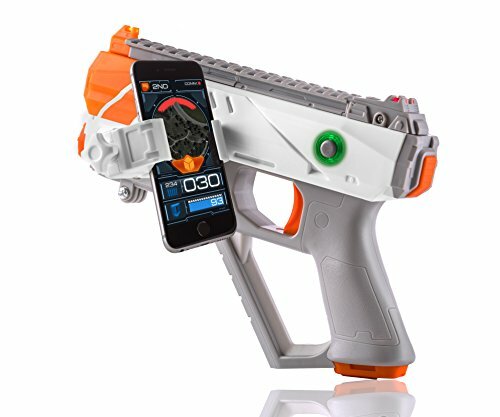 Many years ago, Nerf tried to enter the smartphone laser tag market with their Lazer Tag Augmented Reality system (LTAR). While these blasters were well received, they failed to become a huge success and are currently discontinued. Funded through Kickstarter, the HEX3 AppTag blaster was another attempt to introduce smartphone laser tag to a wider audience. While the end-product looked like quite a fancy blaster, the initial reviews weren’t good and the project didn’t succeed. Another crowdfunded smartphone laser tag system is the very neat Father.IO Inceptor. This system is a bit different in the sense that you don’t actually need a laser tag blaster. Your smartphone in combination with a small device – the Inceptor – acts as the blaster. The project has raised nearly half a million dollars so far and is still going strong, but time will tell whether it will truly succeed. As mentioned, Recoil was launched in the second half of 2017, taking advantage of the insane popularity of the smartphone app Pokemon GO. Taglined as “The World is Now game”, Skyrocket introduced Recoil with a big marketing budget spent on an impressive website and a bunch of fun YouTube videos. Recoil is not really a home laser tag set, unless you have a big backyard. You will need to take this game outside as you can’t play it inside the house. 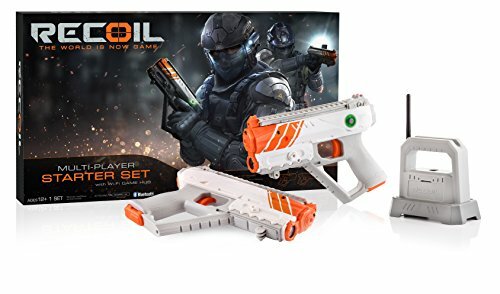 The so-called Recoil Multi-Player Starter Set is what you need to get two players set up in a laser tag battle. What does this set include? 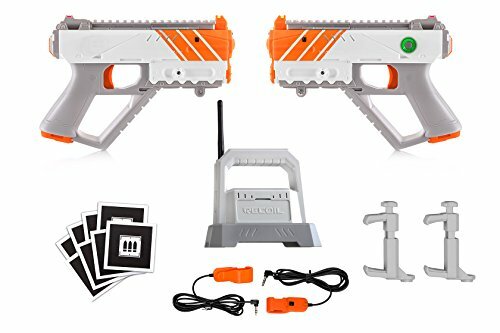 The starter set includes two white-orange blasters, two phone mounts, a WiFi game hub, two damage sensors and eight AR markers. Once you’ve purchased one or more sets, you can download the free Recoil AR powered mobile gaming app (Android and iPhone) in order to play. Each player has to pair their smartphone and blaster via Bluetooth. The compact blasters (aka RK-45 Spitfire) are comfortable and easy to use and give you an actual kickback when firing. The WiFi game hub functions as a GPS enabled local network router with a maximum range of 250 feet. The 3D Positional Audio is a great feature that gives you live feedback in your ears while you’re battling it out. Instead of buying multiple sets, you’re better off buying additional blasters. Recoil laser tag guns come in two versions: the RK-45 Spitfire and the SR-12 Rogue. The starter set comes with two Spitfire blasters with phone mount and damage sensor. As many as 16 players can join a battle at any given time which is awesome. The best way to play a Recoil laser tag game is outside in a park or some sort of confined area with a group of people. It’s not a good idea to just play it outside on the streets for safety reasons. This also means that this set isn’t really suitable for two players. You would need to at least four to get the most out of this laser tag system. As mentioned, we have our doubts around smartphone laser tag because we like things simple. But maybe we should go with the times? Recoil laser tag by Skyrocket looks very promising. What we like about most is that they haven’t cut corners. Skyrocket has gone all out in an attempt to get a really cool and sophisticated AR laser tag set on the market. As it was only recently launched and since it’s quite a feature rich system, there is little doubt that the first version will have some minor issues and inefficiencies. But that’s cool, home laser tag systems are never perfect. If smartphone laser tag is not your thing, we recommend you have a look at Call of Life, Laser X and Nerf Phoenix LTX. They are still our top 3 home laser tag sets currently available on the market. But hey, we really do like Recoil. We just need to go with the times.